We’re incredibly proud of the hard work they put in to earning these designations, and the passion for their profession that this hard work reflects. We look forward to seeing how our patients benefit from their expertise. ProRehab-PC is proud to announce that Aaron Goelzhauser, Will Tank, and Melissa Tolbert have received training and earned the professional designation of Orthopaedic Clinical Specialist (OCS), while Jenna Gourley and Kyle Pierson have received training and earned the professional designation of Sports Clinical Specialist (SCS). The OCS and SCS Board Certifications are granted by the American Physical Therapy Association (APTA)’s American Board of Physical Therapy Specialists (ABPTS) and involve rigorous application and examination processes. Roughly 6.5% of the physical therapists in the United States are Board Certified in a specialty, and only 3.9% of therapists in the United States are Orthopaedic Clinical Specialists. Fewer than 1% of physical therapists are Sports Clinical Specialists. To book an appointment with one of ProRehab’s expert physical therapists or to learn more about ProRehab-PC, please visit http://www.prorehab-pc.com. ProRehab is a private physical therapy practice with locations in Evansville, southwest Indiana and western Kentucky. Known for teaching and training physical therapists throughout the region, ProRehab physical therapists are proud that patients ask their doctors to send them to ProRehab for orthopedic care. They deliver hands-on physical and occupational therapy based on the newest research to achieve the best results for patients with bad backs, achy joints, wounded hands, and sports and work injuries. Along the way, the ProRehab family has fun and makes friends with their patients; patients are actually sad to leave after their treatment is over! 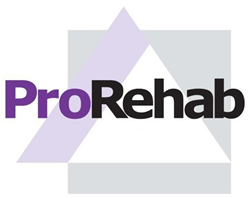 Find ProRehab on Facebook, @ProRehab on Twitter, and FourSquare.